Giveaways. They're great, aren't they? They can be so useful for representing your shop - they don't always lead to sales, I think it's important that everyone knows this - but you have to choose the right items. There's no use grabbing your cheapest item, or the item that no one seems to like in the hopes of getting rid of it, because it won't reflect very well on your shop, and you're better off not giving anything away at all, and disassembling the product altogether. Well, I enter giveaways, but I usually only enter them if I genuinely want one or all of the prizes. I think it's a bad idea to enter a giveaway just because the item is free, when you don't really want/need it, as it's not fair on other users, or the donater. I stumbled across a giveaway a few weeks ago on Pulp Sushi, though, that I fell head over heels for. It was for a couple of t-shirts. I've been trying to build up my summer wardrobe (which previously only consisted of two t-shirts, one with a tiger cub, another with Garrus from Mass Effect (since Mordin wasn't available for the ladies), both black), so this was a great opportunity. So I went ahead and entered, and one of them was to choose which of the four "The Women" was your favourite. I had a good look, but because I'm still going through a strong woodland phase, I picked The Horned. I submitted all my entries and wandered off, thinking back every few days about it and hoping. I loved the t-shirts, I love most of the things on the website, in fact, but my luck never runs that well with superficial things like this (I have what I consider my perfect man and a family who loves me, despite what we all go through, and few but brilliant friends), so I had already decided to add The Horned to my wishlist. I got an email the other day telling me I'd won, it was so stupidly exciting! I must have retold Seeg about seven times that day - literally. Naturally, I chose The Horned as my The Women t-shirt of choice, and I also got a Leopard Butterfly t-shirt dress too! Problem is, now I need to buy some leggings so I can wear it! Excuse the poor photograph. And there was a collar on the apricot t-shirt, but I can't stand t-shirt collars, so I cut them off. I never used to wear them because I find them unflattering, but it only occurred to me recently to just chop them off - so now I can buy t-shirts again! Next in line is a Nightingale t-shirt from Skyrim, and a tentacle one from ZenThreads, which has been sat in my Etsy shopping cart for a few weeks :D Also the tops look a bit loose-fitting, that's because I've been wearing the apricot one, and the dress is a little loose around the body, but I like to customise my clothes a little - tighten here, loosen there, and so on. I'm considering adding lace corsetry a little way up at the bottom to fit it a little more ^^ I might do a tutorial if it goes well! They arrived yesterday, and the t-shirt especially fits perfectly. I may well return and buy some more clothes at some point, but I felt I should share it with you all, because the fabric is great, the designs are great, and the people are great! Hi Kim! I'm so sorry it took me this long to find this post, but it truly made my day! 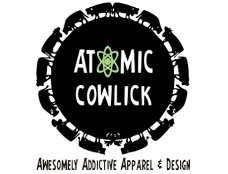 So very happy to hear you love your new Atomic Cowlick goodies and especially excited to hear that you modified the tee by removing the collar. I too, cut up my tee's to make them a little more "me". Thank you for the awesome write-up and I would like to share this on our blog, if that's alright with you. Look forward to seeing your tutorial on customizing your clothes! Hi Kim! I just found this through Rebecca :) I'm so happy you entered and won the giveaway. It's so nice to see someone win a prize and acknowledge it on their own blog and support the hosting blog and person doing the giveaway. You made a great choice and yes, i also cut off the collars of my shirts hee hee! Enjoy!